In my last article I laid out my belief that identifying, diagnosing, and solving anticipatory pains is the most important thing a PS team can do. However, anticipatory pains are not close to the surface, and clients are often not readily giving them up. Step 1 - Form an agreement that there are problems beneath the surface - Our client presents us with an immediate pain and asks us to solve it, but we know there is real anticipatory pain beneath the surface. Our first reaction would be to prove our worth and lay out the details of the anticipatory pain. However, the client doesn't want to hear it: they just want us to solve what is hurting right now. Immediate pain can grind an organization to a halt, so of course we all want to solve the problem. They don't want to hear a full rundown of anticipatory pains when things are hurting right now. What we should do is to set the groundwork for a more detailed discussion after the immediate pain has been addressed. Let our client know we know what the root pain is, and that we'd be happy to not only debrief but also work out a plan of action after we've solved the current immediate pain. This lets our client know that you're not just applying a bandaid, and more often than not, they won't be surprised when you schedule a meeting to discuss anticipatory pain because they already know it's coming. Step 2 - Make anticipatory pains relevant to immediate ones - How do we ensure that anticipatory pains are actioned on?. Anticipatory pains can be foreign to our clients, and if no one within their own organization has brought them up, it may be a completely new and uncharted subject. If we fail to make anticipatory relevant and relational, then we risk those pains being seen as feature requests, which can easily be deferred or brushed aside. One way to make anticipatory pains relevant is to ensure we can correlate those pains to immediate hurt that the client is experiencing. We can get all detailed into how crtiical the anticipatory pain may be, but drawing a direct correlation (even better, causation) allows the client to see there are different approaches to solving the current problem, and some of those approaches may not be entirely evident to them because they tackle problems benathe the surface that they weren't aware of. Making it relevant makes it clear that tackling anticipatory problems will solve their current immediate problem, and immediate problems to come. 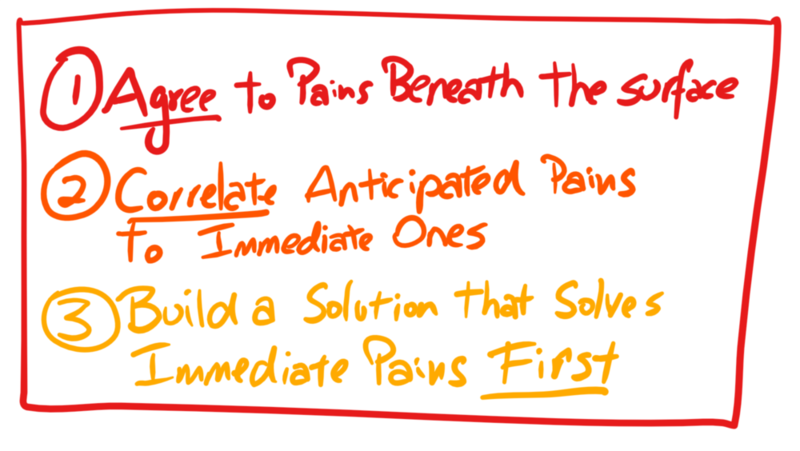 Step 3 - Build a solution to solve the anticipatory pain that also address immediate pains first - When we have convinced our client that solving anticipatory pain is the right approach, we then have to help them solve that pain. In the solution to address the full anticipatory pain, focus the early deliverables of the solution on addressing the immediate pains that they are feeling. It's a victory that everyone agrees the bigger problem needs to be solved, but we must not forget that they are still hurting, and as good trusted advisors, we should be empathetic to that. Tackle some of their immediate hurt so that they can see some results out of the gate. Our client may have given us their trust to solve the anticipatory problem, but that trust erodes quickly if they keep seeing those immediate pains affecting their ability to operate. By being a good partner and prioritizing parts of the solution that tackles immediate problems, we help our clients justify to their own organization the decision to tackle a under-the-surface pain. The three steps isn't foolproof, but it's a great way to storytell and walk the client through a journey of discovery through their own pains. Next time your clients tell you they're hurting, look past the surface, mine deeper, and ultimately aim to solve their real anticipatory pains.